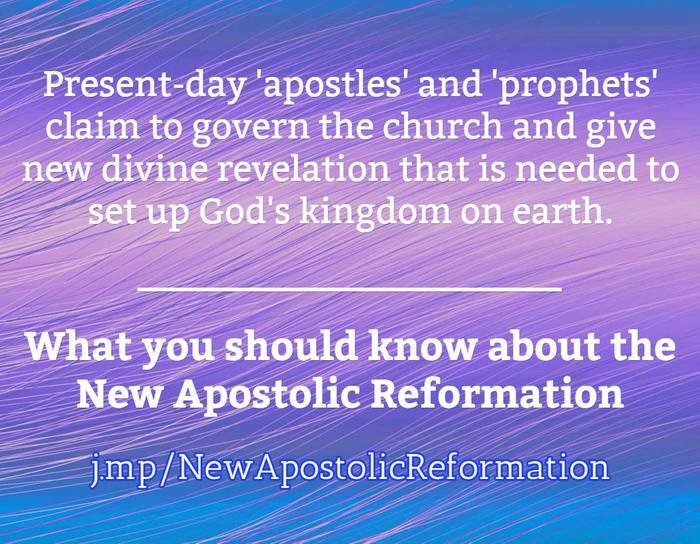 The New Apostolic Reformation (NAR) is a movement which asserts that God is restoring the lost offices of church governance, namely the offices of Prophet and Apostle. They place a greater emphasis on dreams, visions and extra-biblical revelation than they do on the Bible, claiming that their revealed teachings and reported experiences (e.g. trips to heaven, face-to-face conversations with Jesus, visits by angels) can not be proven by the ‘old’ Scripture. The new Apostolic Reformation (NAR) sprang from the Pentecostal and Charismatic movement. They claim that they have been given authority to lay the foundation for the “new” global church. They believe they are restored apostles called and ordained by God to be the government for the emerging “New Order” church. In order to maintain this governance they stress strict obedience and submission to them in all matters. They claim they hear directly from God, and many claim that Jesus visits them in person. Like the true biblical apostles who established the early church, these so called restored apostles believe they are called to lay the foundation and government for the new Kingdom (one world church). Their goal is complete and utter control of the church and subjugatation of its current governance to them. They want power, dominion and total control. They truly believe that the world is awaiting fulfillment of a take over by a militant church (Joel’s Army) that will arise, govern and dominate the world politically and spiritually. This is a highly organized group with a global agenda. The movement, which is the brainchild of C. Peter Wagner, incorporates many of the unbiblical teachings and practices of Kingdom Now theology and of the controversial renewal and revival movements. When I began researching the Pentecostal movement years ago, it already had a name. This new movement, however, did not have a name. Because I was planning to teach a seminary course based on it, I needed a name for my course. For a couple of years I experimented with “postdenominationalism,” but strong protests from my denominational friends persuaded me that it might not be the best name. Besides, many of the new apostolic churches have remained within their denominations. “Independent charismatic” does not seem to fit either because (1) these churches see themselves as interdependent, as opposed to independent, and (2) they are not all charismatic in orientation. The name I have settled on for the movement is the New Apostolic Reformation, and individual churches being designated as new apostolic churches. I use “reformation” because, as I have said, these new wineskins appear to be at least as radical as those of the Protestant Reformation almost 500 years ago. “Apostolic” connotes a strong focus on outreach plus a recognition of present-day apostolic ministries. “New” adds a contemporary spin to the name. The New Apostolic Reformation is an extraordinary work of God at the close of the twentieth century that is, to a significant extent, changing the shape of Protestant Christianity around the world. For almost 500 years, Christian churches have largely functioned within traditional denominational structures of one kind or another. Particularly in the 1990s, but having roots going back for almost a century, new forms and operational procedures are now emerging in areas such as local church government, interchurch relationships, financing, evangelism, missions, prayer, leadership selection and training, the role of supernatural power, worship and other important aspects of church life. Some of these changes are being seen within denominational themselves, but for the most part they are taking the form of loosely structured apostolic networks. In virtually every region of the world, these new apostolic churches constitute the fastest-growing segment of Christianity. The Second Apostolic Age began roughly in 2001, heralding the most radical change in the way of doing church at least since the Protestant Reformation. This New Apostolic Reformation embraces the largest segment of non-Catholic Christianity worldwide, and the fastest growing. Churches of the Apostolic Movement embrace the only Christian megablock growing faster than Islam.